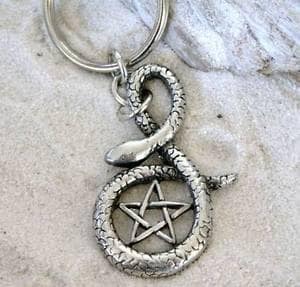 This unique Snake Wrapped Pentagram Keychain is handcast and hand-finished in solid American Pewter with a shiny finish resembling antiqued sterling silver. The Key Ring is the classic split ring and measures 1 1/4 inch or 32mm. Length including loop: 2 1/16"
A Pentagram is the shape of a five-pointed star which comes from the Greek word meaning five lines. The Pentagram has magical associations, and many people who practice neopagan faiths wear jewelry incorporating the symbol. It is often used as a Pentacle which is an Amulet used in magical evocation…generally made of parchment, paper or metal…on which the symbol of a spirit or energy being evoked is drawn.